In contrast to my Standard Chartered Brunei experience, HSBC has been pretty good. 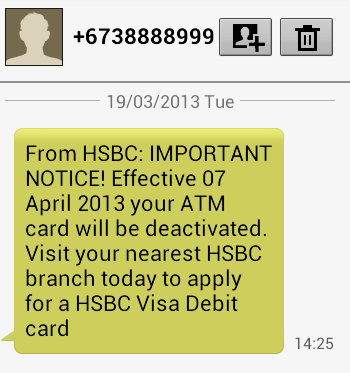 I received an SMS informing that my ATM card would be deactivated and that I would have to visit my nearest HSBC branch to apply for a Visa Debit Card. Sounds straight forward for anybody in Brunei but sadly I am not in Brunei and thus I decided to give them a call. After some verification questions, they arranged to send my card to the closest HSBC branch in Melbourne. A stark contrast to the SCB experience. Now, I can easily tell them my current employer but I honestly don’t remember who was my employer when I answered this verification question. The question wasn’t who was my first employer, just who is my employer. This vague question is dependent on when I first answered this question, or whenever I updated the question. I asked the lady when could I have answered this question so that I could trace back which employer I was with at the time but she couldn’t specify more information and that I had to give a single answer, so I just randomly gave an answer. What is the branch that you opened your account at? But all in all, HSBC has been good and managed to give me service while I’m overseas so kudos to them! Now I wonder how other Brunei banks deal with overseas customers.